Rinse chick peas well. You can place in a bowl and sprinkle with 1 TBS baking soda to remove the husks). I omit this step and use the whole chick pea, husks and all. Place chickpeas in a food processor and grind to a coarse meal. Add tahini, garlic, cumin. Pulverize about 45 seconds. 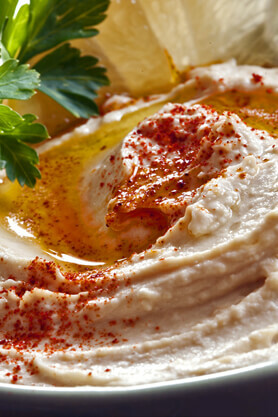 Slowly add olive oil and lemon juice; alternating between each, and continue to process for about 5 minutes, on and off, until the hummus becomes smooth and creamy. Remove to a serving bowl and sprinkle with paprika (I mix this spice in blender). Garnish with parsley, black olives. Serve alone with bread or crackers/carrots/cucumbers, or serve as a counterpart to vegetable fritters such as fried eggplant.